Refugees from Burma are community-centered cultures, so celebrating various festivals throughout the year is very important. Celebrations typically involve dancing, speeches, music, food, sports tournaments and more. Community members dress in traditional clothing to show respect and pride for their culture. Learn more about these community events below. Karen Revolution Day is held on January 31 and commemorates the beginning of the Karen uprising on January 31, 1949. In Burma, the event features a military parade along with dancing and speeches. 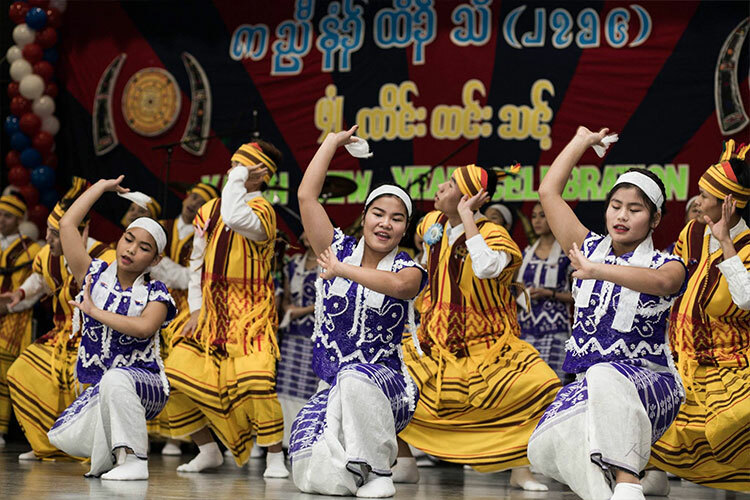 Karen National Day is held on February 11 and commemorates the demonstration on February 11, 1948 when Karen people demanded their own homeland. This event also involves a military parade when celebrated in Burma. Buddhist New Year/Water Festival is celebrated in mid-April. During the ceremony, participants show respect to elders by sprinkling water on them and make offerings to spirits. Additionally, women and girls wear a yellow flower in their hair and perform a special dance. In Burma and Thailand, people fill the streets and spray each other with water for several days. Karen Martyr’s Day is held on August 12 and commemorates the anniversary of the death of Saw Ba U Gyi (the first president of the Karen National Union) in 1950. Others who have fought for the Karen are also honored in remembrance of the Karen resistance. The annual Karen Wrist-Tying Ceremony is held in August (some celebrate at weddings too). It is rooted in the Animist belief to call back the spirits and bring good fortune. Monks and elders sit with a basket of 7 items in front of them: cold water, white threads, rice balls, triangular-shaped lumps of sticky rice in the packages, boiled bananas, paw woung flower branches, and sugarcane. They place each of these items in the participant’s hand and then tie a string around the wrist with yellow or white string. The meaning of the wrist tying is so the person is connected to one’s spirit and therefore can live free from fear. Sweet December is held on November 30 and marks the beginning of the Christmas celebrations for Christians. People go to the church to play games and sing, and when the clock strikes midnight, they celebrate by eating a rice soup called may klaw. Karen New Year is celebrated on the First Day of Pyathoe on the Lunar calendar, which is generally the end of December or beginning of January. It marks the end of the harvest of one rice crop and the beginning of the next rice crop. Karen New Year is the largest celebration in the Karen community and is celebrated nationally throughout Burma.